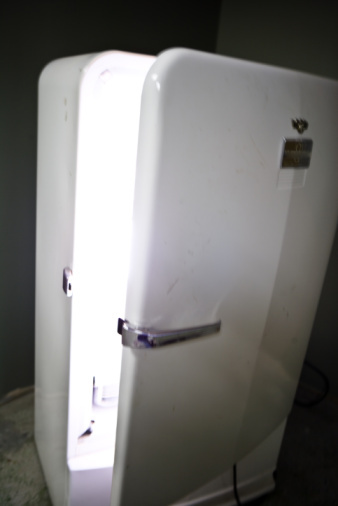 New fridge-freezer models don't use freon as a coolant, but older refrigerators often do. If you noticed that your refrigerator is leaking freon, don't be alarmed. Although freon is very damaging to the environment, it's not harmful to your well-being. While keeping up with home appliances can often be an intimidating task, it's possible to fix a freon leak on your own. Freon is a gas that's used for cooling. When used in a freezer, it keeps your food cold and the overall temperature below freezing. Freon is a colorless, non-flammable substance, but if it's leaking, then it can smell like fresh-cut grass. Most modern refrigerators don't use freon anymore. Instead, they use a refrigerant called HFC-134a (1,1,1,2-tetrafluoroethane). This highly scientific word means that this type of refrigerant won't damage the ozone layer like freon does. There are two types of freon mixes: One that is used in residential cooling systems and R-22, which is considered to be more environmentally friendly. There are many ways to check if your refrigerator model leaks. The most common way to detect if your model is not working correctly is if the motor is continuously running. It's important to see if your motor is continuously running or not. If the motor is running non-stop or your food isn't cold, you can purchase a leak detection kit. Although you can purchase leak detection kits at many appliance repair shops, home maintenance and auto parts stores, they're also sold online. If you don't want to wait to buy a leak detector kit, then you can use a soap and spray solution. Freon leaks create small bubbles. So all you have to do is mix dish soap and a little bit of water in a spray bottle. Afterward, spray all of the piping. If your refrigerator leaks, little bubbles should appear. Your last resort is to call an appliance repair specialist. They will swiftly diagnose the issue. If you do have a freon leak, then your refrigerator will need to be replaced and not repaired. To prevent freon leaks, it's important not to repair appliances that you don't know how to fix. Freon leaks can occur if you pry open, puncture or cut into the tubing of your fridge. Also, if you have a habit of scraping ice out of your freezer, like most of us do, don't do it. If you scrape the ice out of the freezer incorrectly, you can damage the inside of the fridge. A leak can also be caused if you incorrectly use a pressure gauge on the tubing. If incorrectly applied, you can break the seal, which can cause leaking freon. To reduce freon leakage, invest in regular maintenance or purchase a new model.